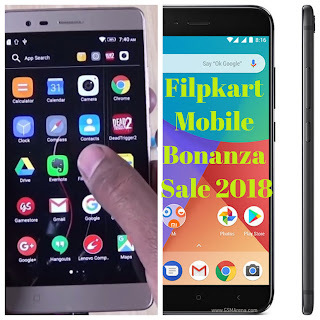 The Big Indian e-commerce website has decided to hold a mobile bonanza sale for 2018.The sale will started on January 3 to January 5 of coming month. Main Thing is that The company plans to give you Flipkart buyback guarantee at Rs 149 and no cost EMI facility on all banks. Along with this they will also offer exchange offerss up to Rs 18,000. Google Pixel 2 will be available at Rs 39,999. Xiaomi Mi A1 will be available at Rs 12,999 after the Rs 1,000 discount. Lenovo K5 Note with 4GB RAM and 64 Gb of storage will available at Rs. 11,481 from Rs. 13,499. Moto G5 Plus will be available at Rs 9,999 after the huge discount of Rs 16,999. Samsung Galaxy S7 will be available at Rs 26,990 during the bonanza sale. K8 Plus will be available from Rs. 8,981.